If you are a fan of wild-foraged foods, you’re probably already familiar with fiddleheads, the tightly coiled heads of certain ferns. The origin of their charming name is readily apparent in their resemblance to the scrolled head of a violin. Not every species of fern is good to eat, so don’t be tempted to pick fiddleheads yourself unless you’re 100% certain of their identity. Of the edible species of fern, two are most commonly consumed: the Lady fern, (Athyrium filix-femina), found in western North America, and the Ostrich fern (Matteucia struthiopteris), found in the Northeast. 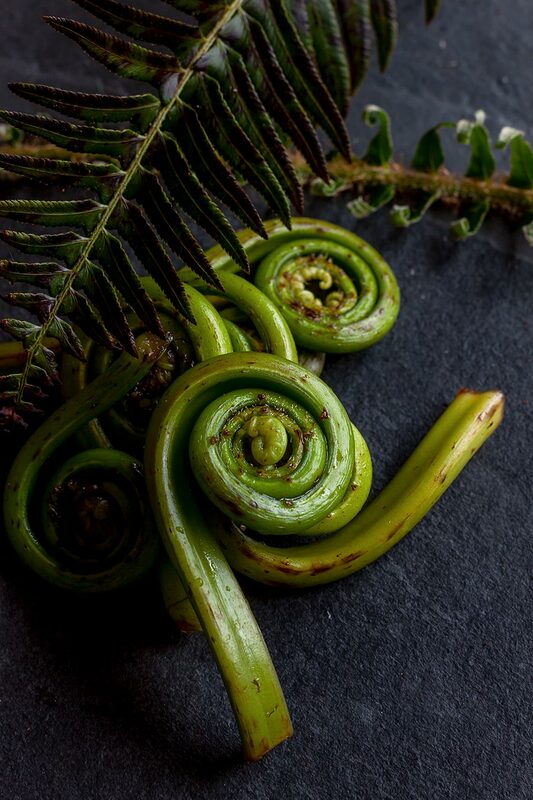 Of these two, the Eastern ostrich fern fiddlehead is generally preferred by most diners because of its milder flavor. But no matter which fiddlehead you choose, the method of preparation is essentially the same. A quick blanching in a boiling water bath (2-3 minutes), followed by a plunge into icewater is the standard first step. Blanching not only cooks the fiddlehead to the tender-crisp stage, it also leaches out much of the bitter tannins that some people find objectionable. Once this crucial step is complete, you can prepare and serve fiddleheads in much the same way as you would asparagus, green beans or other crisp, green vegetables. The wild-but-mild flavor of fiddleheads pair well with other foraged spring vegetables. In this recipe, they share star billing with another favorite, ramps (also known as wild leeks). 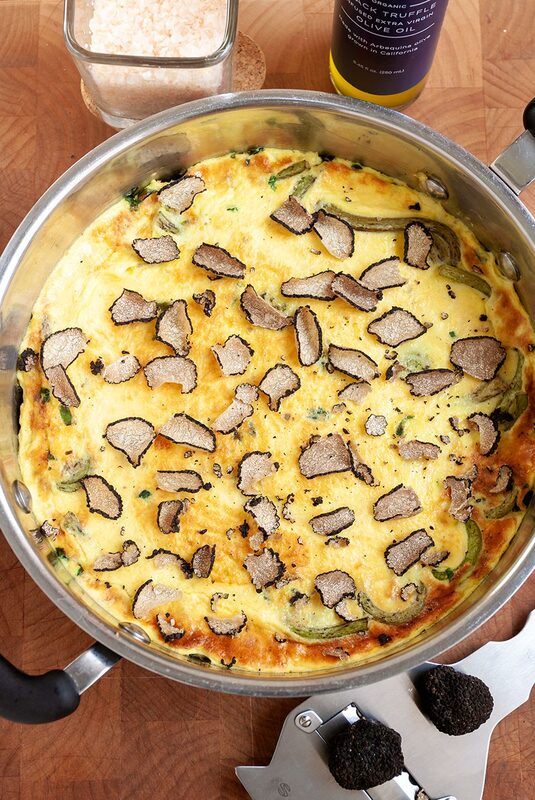 We’ve topped this simple, easy to make frittata with paper-thin shavings of delicate summer truffles, which are just coming into season. 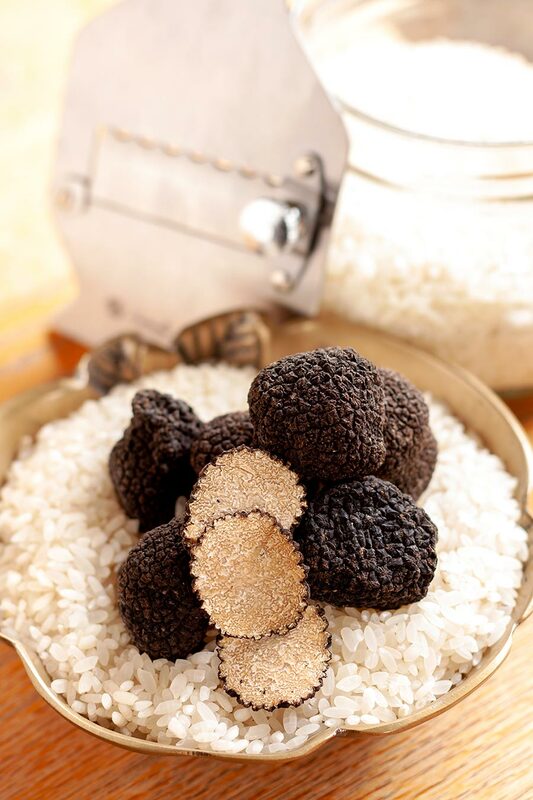 For those who want more truffle aroma and flavor, try finishing this dish with a few drops of organic black truffle oil. Frittata, omelet or quiche – what’s the difference? All three dishes often share some common ingredients (eggs, of course), but there are some key distinctions in their preparation. To keep it short and sweet: quiche is prepared in a pastry crust, an omelet is filled and folded, but a frittata has all of the ingredients incorporated right into the crustless, eggy base and is usually finished in an oven or under a broiler. Blanch the fiddleheads in a pot of salted boiling water for 2-3 minutes or until tender. Drain and plunge into cold water to chill. Drain again and pat dry. Clean the ramps, removing the roots, pulpy capsule and “button,” rinsing well. Pat dry, slice thinly and set aside. Heat a heavy nonstick skillet to medium and add the butter and olive oil. When the butter and oil have melted and are hot, add the fiddleheads and ramps and sauté lightly, just enough to soften them, about 2 minutes. Meanwhile, in a medium bowl, whisk together the eggs, the sour cream, salt and pepper. When the fiddleheads and ramps are ready, pour the egg mixture into the skillet and reduce the heat to medium low. Cook until the bottom and edges are set, about 6-8 minutes (the top will still be uncooked), then slide the pan under the boiler until the top is golden brown. The cooking time will vary according to your broiler, just watch carefully to make sure it doesn’t scorch. 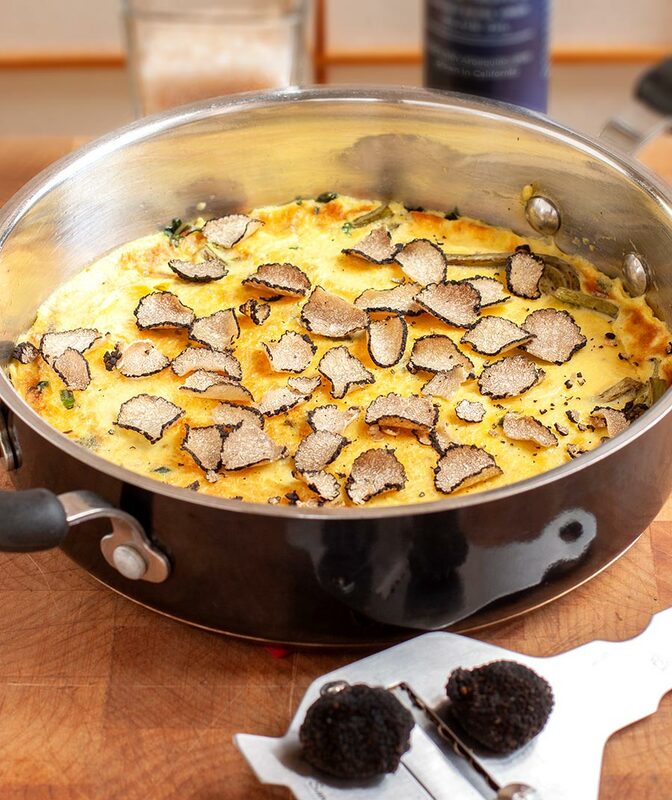 When the top is set, remove the frittata from the broiler, thinly slice the truffle generously over the top and drizzle with a few drops of truffle oil, if using. Serve warm or at room temperature.